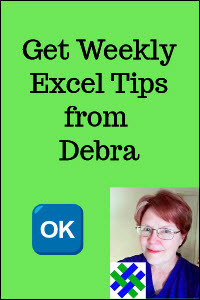 How to create and show Scenarios to store and compare different versions of the data in a worksheet. 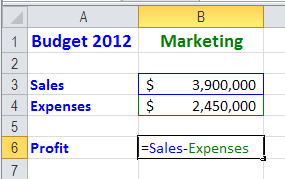 You can use Scenarios in Excel 2003 to store and compare different versions of the data in a worksheet. For example, when preparing the annual budget, the Marketing and Finance departments may have different forecasts for sales and expenses. Instead of creating different files, store each forecast as a Scenario, then print them separately, or compare the forecasts side-by-side. 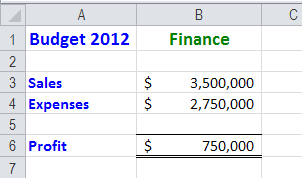 Although Excel scenarios can be complex, a simple example is used here. From the Tools menu, choose Scenarios. Type name for the Scenario. For this example, use Finance. (optional) Enter a comment that describes the scenario. The Scenario Values dialog box opens, with a box for each changing cell. You could modify these values, but in this example they contain the values currently on the worksheet, and don't need to be changed. Click the OK button, to return to the Scenario Manager.